Gems are crystalline minerals or petrified material that can be used as a distinct and advantageous remedial measure in astrology. Gems are considered to be the best for strengthening the positive influences of planets. They intensify the rays of the planets they represent. These Ratna and Uparatna work on the basis that the colour of the selected crystal should correspond closely with the main energy points of the body known as chakras. It also affects on Psychic powers of an individual. When the vibrations within a gemstone are in harmony with the particular vibrations of the wearer, they complement each other. This will then ensure a state of well being. Conversely, when the peak and troughs of the vibrations are out of phase they cancel each other and there is no effect. The seven visible planets and two invisible ones are : the SUN, MOON, MARS, MERCURY, JUPITER, VENUS, and SATURN, along with the two lunar nodes, RAHU (ascending lunar node) and KETU (descending lunar node). These nodes are the two intersecting points of the solar and lunar planets as seen from the earth. 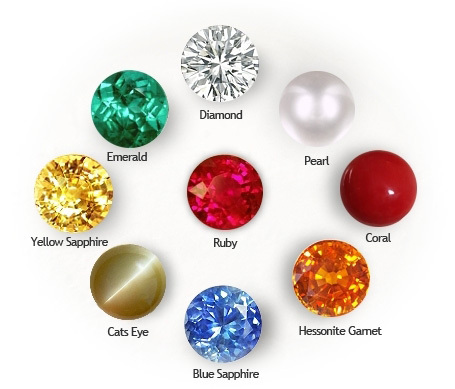 Nine astrological gemstones are associated with these planets. Associated with the Sun is the RUBY, with the Moon is the PEARL, with Mars is the RED CORAL, with Mercury the EMERALD, with Jupiter is the YELLOW SAPPHIRE, with Venus is the DIAMOND, with Saturn the BLUE SAPPHIRE, with Rahu the HESSONITE GARNET, and with Ketuis the CAT'S EYE CHRYSOBERYL. Associated with the nine planets are also the days of the week, different parts of the human body and different metals. Associated with the nine planets are also the days of the week, different parts of the human body and different metals. There are many other gems also which can be used after proper consultation. For more details visit to our office of contact us. For the appropriate selection of the Ratna and Upartna for you we will provide consultancy as well as sale of the genuine ratna and uparatna.